No, Carson Wentz isn't playing. 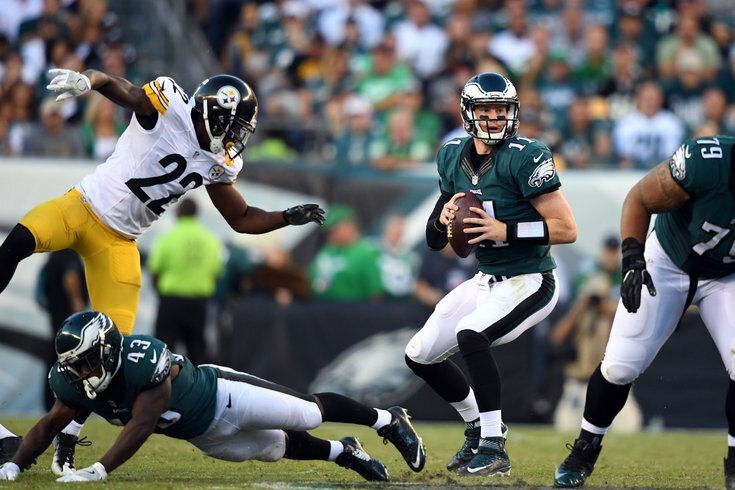 The Super Bowl champion Philadelphia Eagles will be back on the field playing against another team on Thursday night for the first time since they hoisted the Lombardi Trophy in February, when they take on the Pittsburgh Steelers in their preseason opener at Lincoln Financial Field. The Eagles have shown all sorts of different combinations in their secondary throughout training camp, but the first preseason game should be the first really good indication of how Jim Schwartz intends on lining up his personnel when the season begins. The guess here is that the starters will be Jalen Mills and Ronald Darby on the outside, with Sidney Jones in the slot. How Jones plays in the slot will be of particular interest, if indeed that is where he'll line up, and hopefully we'll get to see him one-on-one against Antonio Brown. Like with the corners, Schwartz has rotated his linebackers quite a bit during camp as well. Thursday night could be the first glimpse into who is winning the WILL linebacker spot so far between Corey Nelson, Kamu Grugier-Hill, and Nate Gerry. Rookie sixth round pick Matt Pryor has been a standout in training camp, but can he carry it over into the preseason games? He should get plenty of reps, and may even play both at guard and tackle. Meanwhile, Chance Warmack really needs a good showing to help keep his spot on the roster. Halapoulivaati Vaitai is the team's swing tackle, Isaac Seumalo is the backup center (and other positions), while Pryor, as noted, is pushing for a role as a backup guard and tackle. All Warmack does is play guard. If he isn't better than Pryor in the preseason games, it's going to be difficult to justify his standing on the team. Yes, I'll be closely watching the Eagles' punts, assuming Doug Pederson actually punts this season. While Pederson said that his comfort level with Cameron Johnston is "extremely high," anyone with eyes and a press pass can easily see that he has struggled in practice. Johnston will have a chance to change perceptions in the Eagles' first game setting. And as always, the biggest thing to accomplish in any preseason game is to come out of them healthy. The Eagles are a veteran team that shouldn't need much preseason exposure. Doug Pederson will likely get his starters in and out quickly in the first preseason game.